From ancient time the mother of us all. Braving waves, wild storms and thirst of deadly calms. Receiving wisdom – fee paid in full. Three times held new-born sons in wonderous joy. Beginning age-old cycles of their own. Surprised, I learned new cycles, too. Charmed gift of words revived. Where I can create life anew. In lines I write, and stories told, as I have heard. The seas above are challenging and rough. I sailed them once upon a time. My home lies now beneath the waves on quiet ocean’s floor. And words I write reflect the view from here. This is just beautiful and touching. The kind of stuff that bring tears to my eyes. Thanks for sharing! Thank you. I’m finding I’m in love with writing poetry from time to time. It means a lot to me that you respond. PS. 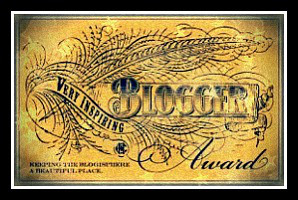 I’m nominating you for Very Inspiring Blogger Award. I’ll send a more formal message with the requirements of your accepting (which you probably know). I truly understand if you choose not to. I think it is a time consuming process. This is wonderful. It has so much depth and meaning. You are truly a gifted person. Thank you. Writing 101 has revealed my gift to me. Writing spills out from somewhere deep inside of me, from a room whose door I had not known to open. It’s an humbling experience.